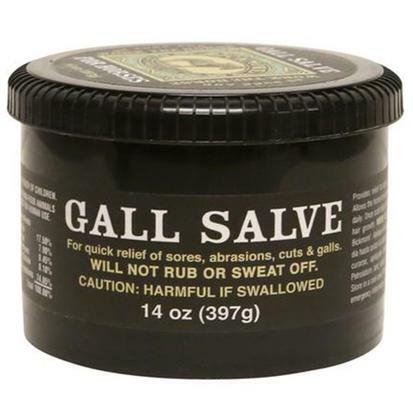 This salve gets your horse quick relief from sores, abrasions, cuts, scratches, and galls. It has been designed not to rub or sweat off. Bickmore’s gall salve is a topical antiseptic ointment that addresses the itching and irritation of fungus, eczema, and ringworm. This formula contains Alum, Borax, Oxyquinolin Sulphate, and Sulphur and has been used since 1892. It is considered a safe and effective healing agent even while the horse is at work. This is the larger 14 ounce size of Bickmore’s Gall Salve. This topical antiseptic ointment has been bringing horses relief since 1892. It has emollients to soften, soothe, and lubricate damaged skin eliminate the itching and irritation of ringworm, eczema, scratches and fungus. This salve won’t sweat or rub off and provides long lasting relief. Uses Alum, Borax, Oxyquinolin Sulphate, and Sulphur as active ingredients.